It's been a while since we released the beta of From Earth. Initially, I hoped there would be enough feedback to help get the game into a good shape. But because of the game's broken state and my poor marketing skills (I didn't know how to make good trailers), we didn't get the requisite number of players to get it off the ground. There were too many problems to fix, and I felt that even if I managed to fix them all, the buzz would have already been gone. I was suffering from depression at this point, after putting so much effort into a game that didn't get even the attention my previous mod projects had received. I was also looking into starting an indie company, and Source wasn't something I would be able to use. So, after a while, I started to spend less and less time on working on From Earth patches and more on learning how to use Unreal 4. But even before the beta, From Earth had a lot of problems. At the beginning, From Earth was supposed to focus on figuring out how to use alien technology. There was a moment in the television show Farscape about the only human, John Crichton, trying to figure out how to open a door. In the 2006 video game Prey, the protagonist Tommy picks up an alien gun and instantly knows how to use it (the explanation being, I guess, is that he was in the army and thus knows weapons). I wanted to make a game that focused on these kinds of interactions - of figuring out how to access and utilize the unknown. My initial concept had a lot more complicated items and weapons than in the final game. You had an "examine" mode where you looked at the different buttons, and you had to bind each button separately. Before there was Daniel Tejnicky I had to do the concept art myself. But my initial attempts at this mode were clumsy. Just to use a vending machine you first had to go into "button pressing mode". Pressiong the +use key didn't activate a button but rather locked you to a position near the machine and clamped your view to the available buttons, and there was a separate animation where the player would look at all the different buttons. 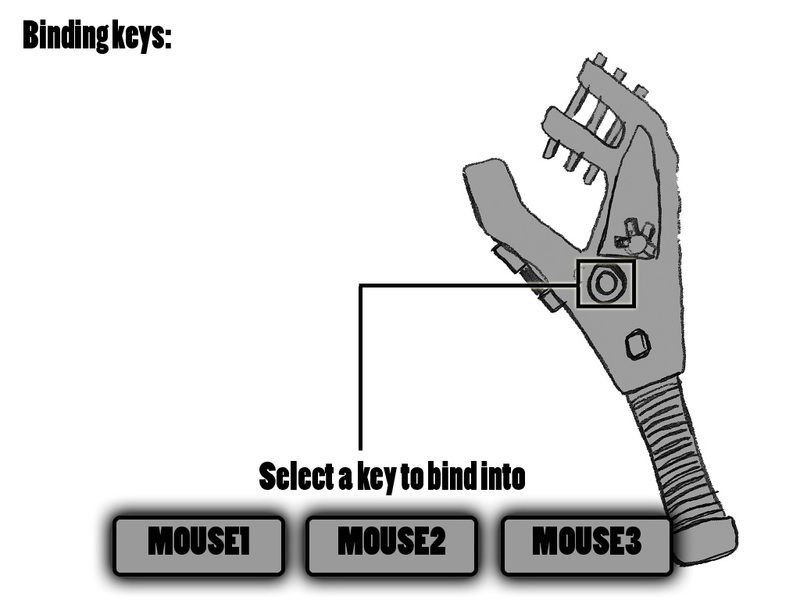 We simplified the use of machines, where you just look at the buttons freely and select them with your mouse. Items still had the "examine" mode, but it was still a little clumsy. In some cases, players would not hold the "examine" button long enough to see the tip messages for the buttons. We also didn't end up designing a lot of different items with multiple buttons or complex functionality like I had originally imagined, so it didn't go as far as we wanted it to. I had dreams of making a lot more complicated machines the player would have to figure out. I had a scene from the 1927 film Metropolis in mind, where the protagonist is pulling all these levers in panic, trying to stop it from exploding. I wanted complicated puzzles that would result in some kind of nice reward for the player when they completed it. Ultimately, however, I just wasn't very good at designing puzzles. I have always preferred programming and designing new features more than actually trying to come up with gameplay / puzzles with them. It's something that feels like a huge flaw for someone who wants to be a professional game designer - or, at least, a huge flaw for someone who works almost exclusively alone. Often times I would design new features or machines, but they would not always lend to a lot of new gameplay. Or in some cases, I would design a machine but I would not tutorialize or implement puzzles with it. Some ideas might look good on paper or might be nice on their own, but won't work in the whole. It was sort of ironic, since after making my previous project Water I had said I wanted to unify the gameplay, and make less of a hodgepodge of ideas. Yet, it was exactly what I was doing again. The idea of examining machines and learning how to use them might have been an interesting one, but it would have required a lot more planning before starting the game production proper. One of the things I enjoyed the most was doing the character animations. I wanted the player character to have a complete world model (as opposed to view models). I wanted to see the hands pressing the buttons. I wanted to see the legs with proper Inverse Kinematics. I wanted to see the character model when looking into a mirror. This was partly the reasoning I wanted to do the climbing system. I had also played Mirror's Edge at the time and I wanted to try out something similar in From Earth. But again, not all of the climbing abilities lent themselves to new gameplay. My library of movement abilities wasn't already quite as big as Mirror's Edge's or even Tomb Raider's. On top of that it took a while to get system working well. I redid a lot of the player movement system in Source, completely redoing stuff like jumping. Initially jumping was completely animation based. The moment the player's feet lifted off the ground was marked by an animation event. This meant jumping had a delay, which in turn made even basic movement sometimes quite tricky. Being able to hang on cliffs was also troublesome, since the camera was fixed on the character model's eyes I had to do a lot of magic making sure the view would follow the animation in some cases and be free moving in others. One such instance was when the player would try to jump backwards the camera would often randomly rotate to left or right. There was a lot of camera problems like this, and they weren't just limited to the climbing system either. Of course, debugging and fixing problems like this is normal to game development, but it added to the list of things that I needed to do. There's the saying "Don't fix something that isn't broken." While I was trying to do something different (from HL2) with From Earth, I could have kept the old movement system, and focused on other things. On top of the movement system not being fluid enough, it also didn't work very well with the type of levels that were being built. Mirror's Edge had a lot of tall buildings and rooftops to jump around in while a lot of From Earth was low buildings and forest areas, restricted alleys partly because of the limitations of Source (or my limitations as level designer - probably both). Again, it was a problem of not knowing how to make a lot of good gameplay out of the system I had built. I looked at other games and what their level design looked like on the climbing oriented areas, but I still had trouble coming up with ideas for my own levels. If I had spent more time making just orange textured levels, and focusing perfecting the movement system, it could have become something far greater. Since I knew how to do character modelling I absolutely had to have NPCs running around. I didn't want the world to be just an abandoned place with no-one to talk to. 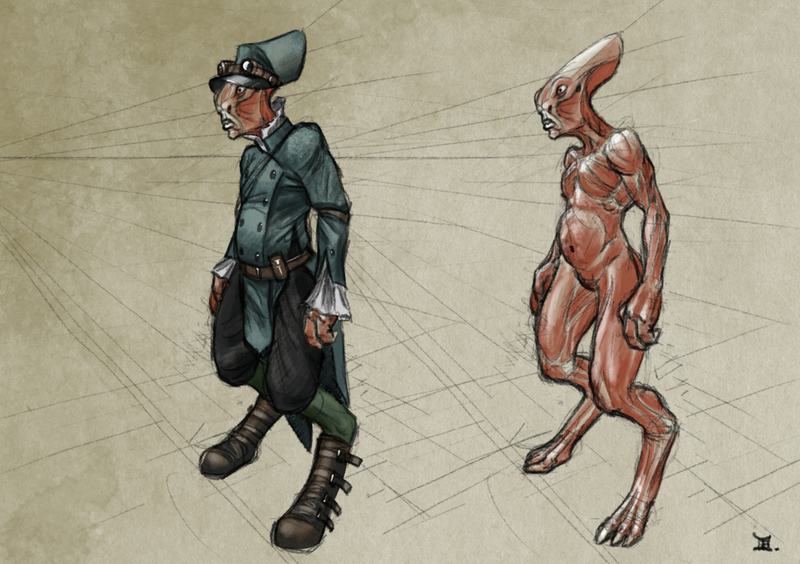 This meant having concept art, modelling, texturing, animating, and voice acting, for both the humans and the aliens. It was a lot of work, but also one of the areas that interested me the most. Bringing character to life is a lot of fun. But once the aliens were introduced I had to come up with their language (as well as conceiving their whole world and culture). While there were suggestions of telepathy and other ways of avoiding an alien language, I quickly dismissed such ideas. But this wouldn't have been a big deal if it had not been for the idea of the language system itself. Originally the aliens were just supposed to talk in their language and there was nothing much more to it. I had written down what everything they said meant, but the player wasn't exactly required to understand what they meant. Part of the fun was having them say something and the player getting a clue as to what it might mean purely from the context and the tone of the voice. The player wasn't required to understand what they were saying, but could try to if so inclined. That was until the idea of building a language system came up. I can't remember exactly who suggested it, but it was one of those things that I became so obsessed with that I couldn't help but try it out. Even when I was making it I knew that it was probably a bad idea to add something so ambitious this late in development, but I did it anyway (there was no-one else in the project to tell me no anyway, since I was the only active developer a lot of time). 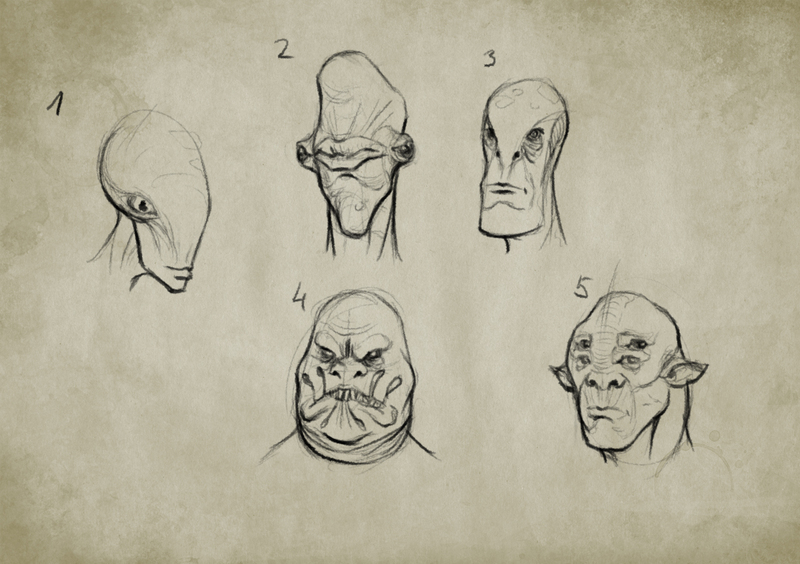 Early tests for the Entrulians. It was perhaps the most complicated part of the code, and completely new ground for me in terms of programming. I had to program a way for the player to speak sentences with somewhat random structures. All the words were hard-coded in, and there was three different "sentence structures". The sentence structures defined where the verbs and nouns would go in a sentence. The code also had a list of all the possible sentences the player could say. When the player would speak a sentence it would go through the list of sentences and try to match one. If the player said a sentence that wasn't quite correct, sometimes the aliens would try to ask you if you meant something else. There was also wildcards, optional words, politeness meter, and synonyms. The concept was that the player had to listen to the world to first unlock words, which would then be added to their vocabulary. Then they would have to listen around the world to record sentences. Some of these would go to a log where the player could then read them again. I would set up things like advertisements holograms in the level, and the hologram would, for example, say "If you see an Outsider, press the button for the alarm! Protect Aalysih." This hologram was included in the same area where the player needed to ask an alien to press a button. But of course, it didn't really work that way in practice. Hearing something doesn't necessarily mean players will recognize those words in text. Assuming they even understand the concept that this is what they are meant to say (The holograms didn't really have any kind of visual for "pressing a button"). A lot of these hints were added to the levels as kind of patch work, in some cases when I realized people could skip a level and not unlock the required sentence before. On top of being a lot of trouble to tune as gameplay, it was also a lot of work to get into game. Recording the alien voices lines was already a big task. We had two talented voice actors, Dianna Conley and Joseph P. Bracken, for the female aliens and male aliens respectively. Stephanie Nixon did the voice for Zenaida Liu, the main character. For some reason, despite the voice actors being native English speakers, I insisted that the alien words were to be spoken in a Finnish dialect. This was a little bit difficult for them, but they all did an amazing job. Stephanie, on top of having to learn the language, also had to speak every word so that it would work with the sentence system. When a player chose a bunch of words with the language system, Zenaida would say them out loud one by one. I had to do a lot of editing in attempt to make this sound natural, though I didn't quite succeed. Players had the ability to guess and write down what they thought words meant. For example, if they knew "pos" meant "to be", they could write it down in their notes. The next time they would try to translate a sentence it would show their guess "to be" under "pos". There was no way for the game to check if their guesses were correct (people might spell "to be" differently or even in a different language). It was simply a way for them to remember what conclusion they had come to before. But the closed captions also showed these words as the player guesses. So if an alien said "Asu osa pos?" (What are you?) the closed captions would say "Asu osa [to be]?" assuming they had guessed "pos" correctly. This was all in effort to make translating easier, but it was a lot of extra work and hackery. There were also some attempts to make the language system easier or to allow unlocking sentences for free. One way of doing this was to use gestures (hand animations). Instead of using a sentence you might not know, you used a gesture. It basically replaced the confusion of the language system with the confusing gestures. There was also the Mind Meld system that allowed you to read the minds of aliens, but would be considered the same as threatening them. It would show one sentence in English or some vital information like a password they might be hiding. But Mind Meld wasn't in any way explained by the plot. At one point, Zenaida was supposed to have some special abilities at her disposal provided by her Jumpsuit, but they didn't work out. Mind Meld was cut out from the game for most of the development but I readded it during the beta. During playtesting the language system was what got most players stuck. Yet, they preferred to try it instead of threatening the aliens or attacking the guards. It needed a lot more playtesting, it needed a better UI, it needed a lot better in-world explanations and hints. Another system that made things more difficult was the fighting system. Without the language system it might have worked out, but since I focused so much on getting that system to work, I didn't give the fighting system all the attention it needed. Despite this, it had several different iterations. First I tried hard-coding the actions to moves, but then I wanted something a little bit more complex. I wanted to do more of a fighting game style system where key inputs would combo to special attacks. 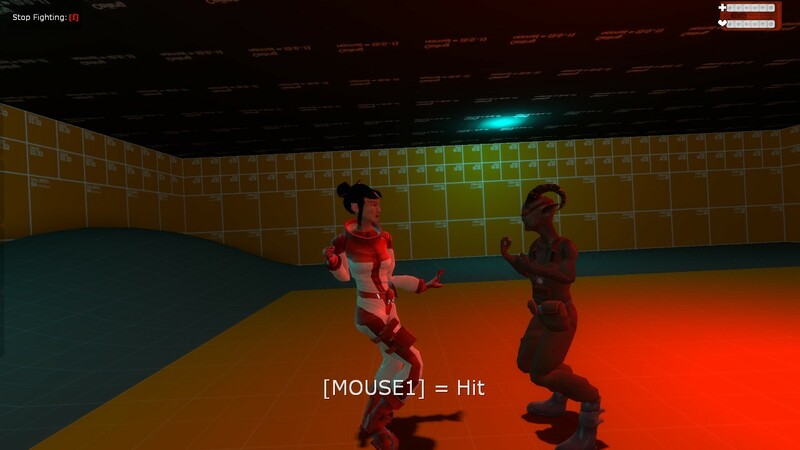 I also had a version where going into fighting mode changed the game to third person (to better see my character animations!) Eventually I ended up going back to first person, but I ended up with a system where all the attack moves were defined in a script file. I had a complex system for different types of attack. You could, for example, grab aliens by their horns and use them as a shield or simply knee kick them without them being able to fight back. Parrying was a bit tricky to detect and animate correctly. It never worked quite as smoothly as I had hoped and wasn't super useful in game. Not entirely sure what's going on here. Partly, the scripting system was supposed to make trying out new moves in the fighting system easier. It did its job to some extent, but also took a lot of time to perfect. There was a lot of time spent on trying out new things and moves that never ended in the game. A big part of the game was also that you could completely avoid combat if you wanted to. The idea was, you could either try to communicate with the aliens, or fight them. You weren't able to attack civilians, but you could still threaten them to get what you needed. This wouldn't make them attack you, but they would tell a guard you threatened them. There was a whole other system for the aliens knowing or not knowing if you were violent. You could for example first fight a guard and then wear a disguise and hide your identity. But none of this mattered if you just communicated with them and didn't use violence or acted in a threatening manner. My time was constantly divided between these two different play styles. The story had two different endings, too, depending on whether you were considered violent or not (with an additional, slightly different ending if you were a pacifist). I should have made a choice between which game I wanted to make. A lot of people were interested in the language system, but it had a lot of problems. 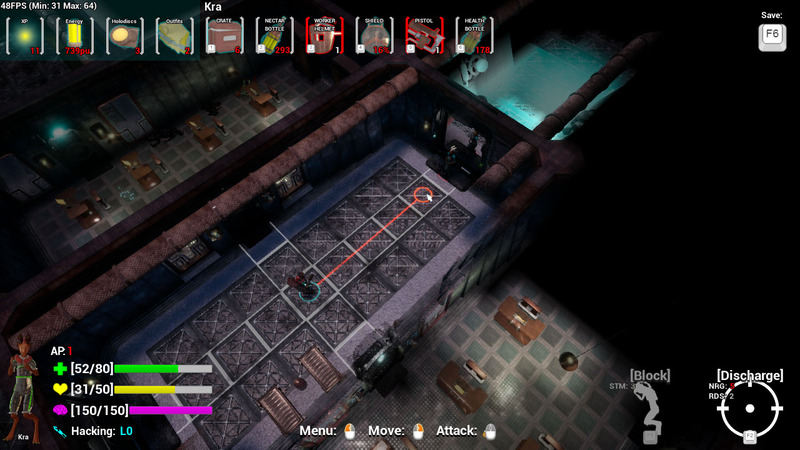 Players would not want to switch to using violence when they had set out to do a pacifist run, and they would get stuck. Instead of trying out the combat system they would simply close the game. Making the game focused on the fighting system would have made it better. Removing the fighting system and focusing on the language system would have also made the game better. Yet, I kept it in with an excuse like "Why wouldn't the player be able to pick up the sword?" It never occurred to me to just simply remove the guards from the game. Or have the story be that Zenaida was a pacifist and simply refused to fight back even if it meant her capture. I think it's safe to say the project was too ambitious. There were way too many things going on, including a lot of things that didn't really fit the world, or at least weren't necessary. I had a lot of fun programming the different systems, and I learned a lot, but fun was also my undoing. There was also a little bit of feature creep in me. Every now and then you will look at your project and wonder "Is it exciting enough?" Maybe if I add this ONE SMALL THING it will get people excited. Maybe this will be the twist that will get the game media's attention. So, that's my excuse for adding stuff like the language system. Though, it's not necessarily a great one. So, am I thinking about continuing From Earth? I have to be completely honest with you: no, not really. Not the Source Engine version anyway. The project has, as it is, way too many flaws to be salvageable. I am currently unemployed and thinking about starting an indie company using the Source Engine is a dead end. That said, I am not throwing it all away or abandoning it completely. I will still continue to update Entrulia, trying to fix any game breaking bugs that are reported best to my ability. I just wont try to fix the larger problems with the gameplay or ship new features. I also have been working on sort of a sequel, called "Entrulia". It uses the same assets and world and largely the same characters. It continues where From Earth left off, but knowing the story is not a requirement. Some parts of the story might get retconned or changed completely, depending on the game's new needs. You play as either "Kra", "Zenaida", or "Water". It's a third person strategy similar to XCOM 2 (one of my favorite games). You only control your hero, though you can have followers. 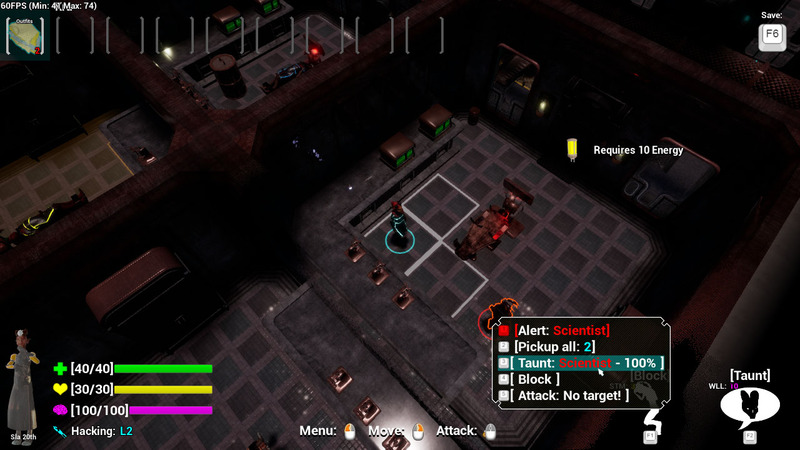 You also have up to four special abilities that you can pick and choose from a list at the beginning of every map. I like to think it as sort of a mix between XCOM and Overwatch. Your special abilities and timing them are necessary for your survival. The game starts with you escaping from prison and the fighting the alien Z-Duw organization determined to hunt down "the Outsiders". The project has gone through several iterations as I have prototyped different types of gameplay. First it was a side-scroller fighting game, then an XCOM type of game, then more of a Final Fantasy RPG game, then a side-scroller fighting game, until now finally coming back to an XCOM type strategy game. During my absence I have also gone through several other game project ideas. I have been trying to spend a lot more time prototyping and trying things out, rather than just going into full development mode right away. Hopefully this one will work out well. I am nervous about starting an indie company, but it's something I have to try out eventually (unless the right job comes before that). I have a lot of worries about how well the game would do, as well as how I will pay the people who worked on From Earth for their work.